But the idea that good people can be devoted communists is grotesque. The two categories are mutually exclusive. There was a time, perhaps, when dedication to communism could be absolved as misplaced idealism or naiveté, but that day is long past. After Auschwitz and Babi Yar, only a moral cripple could be a committed Nazi. By the same token, there are no good and decent communists — not after the Gulag Archipelago and the Cambodian killing fields and Mao’s “Great Leap Forward.’’ Not after the testimonies of Alexander Solzhenitsyn and Armando Valladares and Dith Pran. In the decades since 1917, communism has led to more slaughter and suffering than any other cause in human history. Communist regimes on four continents sent an estimated 100 million men, women, and children to their deaths — not out of misplaced zeal in pursuit of a fundamentally beautiful theory, but out of utopian fanaticism and an unquenchable lust for power. Mass murder and terror have always been intrinsic to communism. “Many archives and witnesses prove conclusively,’’ wrote Stéphane Courtois in his introduction to “The Black Book of Communism,’’ a magisterial compendium of communist crimes first published in France in 1997, “that terror has always been one of the basic ingredients of modern communism.’’ The uniqueness of the Holocaust notwithstanding, the savageries of communism and of Nazism are morally interchangeable — except that the former began much earlier than the latter, lasted much longer, and shed far more blood. At this late date, there is no excuse for regarding communism and its defenders with one whit less revulsion than we regard neo-Nazis or white supremacists. 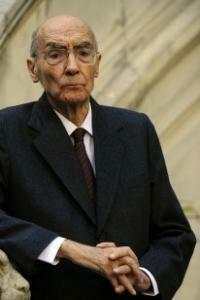 Saramago’s communism should not have been indulged, it should have been despised. It should have been as great a blot on his reputation as if he had spent the last 41 years as an advocate of murderous repression and cruelty. For that, in a nutshell, is what it means to be an “unabashed’’ and “hormonal’’ communist. Anyone who imagines that the horrors of communist rule is a thing of the past ought to spend a few minutes with, say, the State Department’s latest human rights report on North Korea. (Sample passage: “Methods of torture . . . included severe beatings, electric shock, prolonged periods of exposure to the elements, humiliations such as public nakedness, confinement for up to several weeks in small ‘punishment cells’ in which prisoners were unable to stand upright or lie down . . . and forcing mothers recently repatriated from China to watch the infanticide of their newborn infants.’’) Communism is not, as its champions like to claim, an appealing doctrine that has been perverted by monstrous regimes. It is a monstrous doctrine that hides behind appealing rhetoric. It is mass crime embodied in government. Nothing devised by human beings has caused more misery or proven more brutal. Saramago may have been a fine writer, but he was no exemplar of goodness. Good people do not embrace communism, and communists are not good.